Chris Carsten as Jean Shepherd and Cotton Maurer as Ralphie. Courtesy of Broadway in Indianapolis. Used by permission. From the songwriting team behind the smash hit, Tony Award® -winning musical “Dear Evan Hansen” and the Academy Award-winning film “La La Land,” “A Christmas Story, The Musical”, brings the classic 1983 movie to hilarious life on stage in Indianapolis at Old National Centre Nov. 28 – Dec. 3. The production is presented by Broadway in Indianapolis. “A Christmas Story, The Musical” tells the story of young and bespectacled Ralphie Parker as he schemes his way toward the holiday gift of his dreams, an official Red Ryder® carbine-action 200-shot range model air rifle, amid the infamous leg lamp, pink bunny pajamas, a mean department store Santa, and a triple-dog dare to lick a freezing flagpole, along with songs and big production numbers. This musical version that premiered on Broadway in 2012 was both a critical and commercial success and was nominated for three Tony Awards® including Best New Musical, Best Original Score, and Best Book of a Musical. The show’s score is by the composer/lyricist team Benj Pasek and Justin Paul with a book by Joseph Robinette, based on the writings of radio humorist Jean Shepherd.The tour features direction by Matt Lenz and Tony Award®-winner Warren Carlyle’s Broadway choreography will be reset for the tour by Jason Sparks. The production features scenic design by Mike Carnahan, with costume design by Lisa Zinni and lighting design by Charlie Morrison. 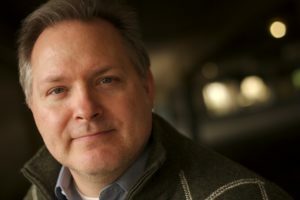 Chris Carsten – Courtesy of Broadway in Indianapolis. Used by permission. Playing the role of author Jean Shepherd who narrates the story and on whose writings “A Christmas Story” is based is Chris Castner. Returning for a fourth straight years, he is a veteran of some 20 years of acting. Recent credits include “42nd Street,” Saturday Night Fever,” and “My Fair Lady” as Henry Higgins (US, Singapore, China). Recently, I spoke by phone with Castner who was in Scranton, Pennsylvania, a stop on the show’s tour prior to its Indianapolis run. Herein is an edited transcript of our conversation. How long have you been with the tour? This is my fourth year playing Jean Shepherd on the tour. I am veteran and thrilled to do it again. It’s a lot of fun. How do you fit into the show as Jean Shepherd? I get introduced at the top of the show. You see me on stage throughout entire show. I say a lot of the same things that Jean Shepherd says in the movie, but you see me as a character. As the show opens I am in a radio booth to set up the show. I am starting my radio show and I decide to tell the story of “Christmas Story” and it goes from there. I come in and out of scenes during the entire show and talking about what is happening just like Jean Shepherd did in the movie. Does the musical follow the film? It does. All the big events in the film. Getting stuck to the flag pole. The bloodhounds. The leg lamp. All the major events are in the musical. We just add a bunch of musical numbers which really give it a different dynamic, but still make for a wonderful, heartwarming tale. Audiences are really enjoying it. You can bring the kids, so it’s a lot of fun. When you come to a live performance as opposed to watching something on film, there is an added excitement. Reactions from the actors happen live. The music is live with an orchestra performing the wonderful score. It’s a Tony-nominated musical that came out in 2012. What is appealing about your role? The very first time I ever saw “A Christmas Story,” it was probably not long after it came out when I was a young man. Much younger than I am now. The first thing that drew me to it was the voice-over. This man was saying these funny things that were happening on the screen. The candor of his voice, the cadence of his voice and the things he was saying were hysterical. It made me enjoy the movie even more. And it just seems ironic that I am playing him now. Having been affected by Jean Shepherd’s narration in the film really informs my choices to make as an actor in the stage musical. Have you read Jean Shepherd’s writings? I haven’t. I know that “In God We Trust: All Others Pay Cash” is a short story of Shepherd’s that that they drew from to make the film. I knew that he is from Indiana and what he wrote in this show parallel his growing up there. I know he passed away a few years back. He has a cameo in the film. I listened to his radio show recently and it was wacky and very funny. Do you try to mimic his voice? Listening to his voice gives some insight into what kind of energy to use. I am in no way a carbon copy of Jean Shepherd. I wouldn’t want to be because I am not him. But I bring my own flair, my own fun and my own choices to it. The way he expresses himself really brings the character to life. I grew up in the Midwest like he did, so my inflection is informed by own background. I was born in Des Moines and grew in in Sioux City, Iowa. When were you first exposed to theater? Well, I had a good friend when were kids from first grade to sixth grade. We went to the same elementary school had a fun chemistry between us. When we were sixth graders he said, “Let’s do the sixth-grade talent show.” We not only talked about acting, we were also goofy together. We did a skit about the news and weather and all these strange things happened to us that we did not intend and made people laugh. They were very funny because they weren’t supposed to happen. It laid the foundation for the two of us because we are both in the entertainment field to this day. We ended up going to different junior highs and then came back together in high school. I was pursuing other things. I wanted to be an airline pilot because I was heavy into science and mathematics, but I wasn’t doing very well at those things. He came up to me in the hallway one day and said, “Why don’t you try out for the school play?” and I said, “Why not?” I ended up doing that and it changed something for me. I got a nice little role and it was so much fun. I met all kinds of new people at school and it changed the kind of classes that I took. I joined the choirs and started doing plays and musicals and I ended up going to school for those things. My friend talked me into going to college where he was going. It was a small school in Northwest Missouri called Tarkio College. It went out of business a couple of decades ago, but it was a great program when I was there. The artistic director who ran the theatre came from Michigan State and he gave this little program a big-school feel, a work ethic and taught us great skills. The way he told us to approach business and the art was second to none. I was grateful I got to work with this man. It was super-duper. It really laid a good foundation. It appears you have been consistently working since college. It has been consistent. There have been some down times. You must do what you must do to make ends meet. I am no stranger to waiting tables and doing catering and working temporary jobs on and off. Are you based in NYC? I was. My wife and I lived in New York for several years. We had a child. We were living in New York in 2008 when the financial crash hit and I was doing a lot of catering when I wasn’t doing shows. Then a lot of our clients were affected, and they cut off the catering budget when that happened. My hours dropped drastically and I really struggled. That’s when we moved to California and that is where we live now. Right now, we are in Fresno because that is where her family is from. We have had two more kids since then and now we have three. If this is your fourth year, do you think the show will go on indefinitely? That is the hope. If people want to come out and see it, it will be performed. The cast changes year after year, but it will continue if there is interest. Do you have a deal to play Jean Shepherd permanently? Well, it is my role to refuse. It is only a certain period during the year, so it is a good little gig to have to kind of rely on for a while. I have so much fun doing it and it is a wonderful experience for me. Well, I have done a lot of tours. I started touring in 1997 and have been doing it off and on ever since. I have gone all over the world touring with different productions. I really enjoy working with new people. I am working with new cast members all the time such as directors, production staff and crews. Going from city to city, there is something so interesting about being out and seeing all the different towns, going to the different venues, from theatre to theatre. It can be grueling at times because I have done tours where you are in a different city every night, just about. And then you get those ones where you stay in one place for a while. That’s nice too. You can explore the city a little bit. Have you ever played Indy? Why is “A Christmas Story” so enduring? Well, I think it is universal. First, it’s a Christmas story so people have certain expectations for “A Christmas Story.” There must be Santa Claus, reindeer, and of course, the North Pole, there is something magical happening with elves and a conflict with Santa. This one is a little different because it is offbeat, it’s quirky, it is endearing, and it’s funny. When the movie first came out, it didn’t get complimentary reviews, but it did develop a universal following for being so universal and precious. People really identified with those crazy things that happen on Christmas and little Ralphie wanting that BB gun so badly, he’ll do almost anything to get it. We have all gone through that shared experience, so people latch on to that. People tune in to watch it on TV and come out to see our musical too. We are not the only production. It’s staged all over the U.S. regularly, especially during the holidays and has become standard fare. It is just a delightful story. What kind of feedback do you get from audience members after the show? People really enjoy the performance. It takes them back. It is very nostalgic for them. Of course, they love the kids. We have a large complement of children in the show and they are terrific. We also we have actual bloodhounds in the show. The whole family dynamic with the mother and “The Old Man,” Ralphie and Randy. The kids just do such a wonderful job. It really makes the show magical. Tell me about the cast in general. The cast is terrific. However, casts change every year, sometimes in small ways and sometimes in very large ways. In the four years I have done it, we have had repeats of the children and a couple of the kids will come back because they were young enough to do it another year, but generally most of the kids change. The principals, “The Old Man” and the mother were the same actors for the first three years. We had a great relationship, a great feel, a great chemistry. This year, we have a new mother and “Old Man “and they are terrific. I enjoy working with them very much. Different actors can approach it and interpret it differently, but that is okay. That is what makes it universal. It is so easy to make it real when you work with great people. It makes my job very easy. It is a great cast and I have made some great friendships with the people I have worked with over the years. Well, they can expect it to be a wonderful evening in the theatre, bar none. Bring kids. It is a family-friendly show There’s color. There is pageantry. There is singing. There is dancing. There is wonderful storytelling going on. It is a can’t-miss show. 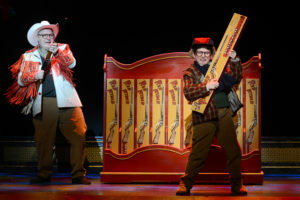 Tickets for “A Christmas Story, The Musical” are available at the Old National Centre Box Office, online at BroadwayinIndianapolis.com, or by phone at 1-800-982-2787.